Home » Administrator Guide • Deal management • How To's » What is Kanban view? Kanban is a very powerful tool for better visualization of projects and opportunities in a card-based view. Kanban is used widely in many industries that need to group and visualize projects depending on their workflow stages on their daily work. The concept was invented and used by Toyota to keep track of the production processes where a task moves through stages and visualizing the current statuss is very easy. What you see in a kanban view, is where your pipeline project and opportunities are aligned today with the stages you assign to each pipeline. A kanban view is like a board with cards, grouped into columns, where cards are your projects or opportunities and columns are the stages you need to go through from the starting point to the finalization of the project or opportunity. In Flexie CRM, the Deal’s module is projected to manage projects and opportunities with a default kanban view. But that you can have kanban view configured in every other entity like Leads, Contacts or Custom Entities as well. Depending the knowledge work of your teams, you can create unlimited pipelines and add the required stages to each pipeline. As team’s work may vary from team to team, the need of multiply pipeline may arise as processes may be different. On your daily work, you can move your projects and opportunities from left to right and progress until you reach the finalization. 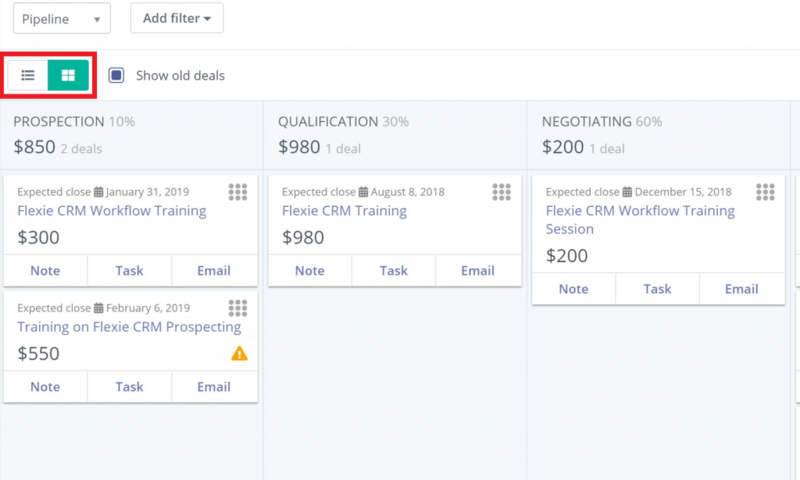 In the Deals module, you can add task, notes and tie deals with Leads, Contacts or Accounts and interact with them directly by Emails, Phone calls or Text. Moving from one stage to the other is very easy with a single drag and drop you put a deal to another stage. You can deal with projects and opportunities manually or automatically with Flexie CRM Workflow Engine. Also you can build a whole notification system for your team and for deal’s related Leads, Contacts or Accounts. Clicking on a Kanban deal will send you to the Deal’s page where you can edit and communicate with all Deal’s related contacts. Using Kanban can help streamline your work processes, have a better visualization of your projects and opportunities. Teams can stay focused, work on their pipeline tasks and deliver results quickly.